In the night to Monday, several sources were reporting massive police force movements towards Idomeni in order to prepare for an upcoming eviction. According to media sources, it is likely that police will start the eviction on early Tuesday morning3. 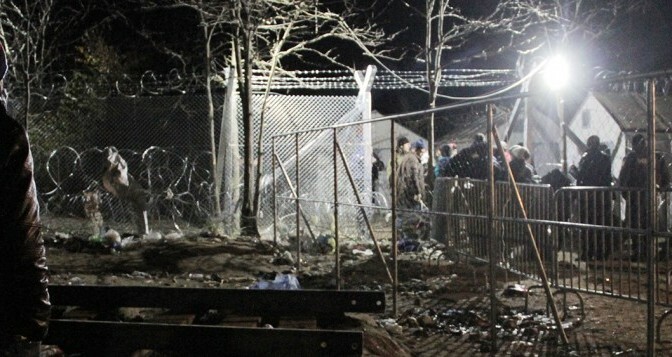 Due to high pressure from the opposition and the latest heavy clashes in Idomeni, the government changed their mind on waiting for a voluntary closure of the camp. The police is hoping for a non-violent eviction, but this seems nearly impossible given the the situation of tension, frustration and desperation into which Greek and European authorities have forced the people in Idomeni. Members of supporting structures in and around Idomeni expressed their concerns about the physical and psychological conditions of the people, were they to be confronted with massive police and military forces: “It is insane to conduct an eviction at the moment. There are hundreds of familes, thousands of children and many people in bad physical conditions, this will create enormous damage and raise frustration even more”, S. explained. Referring to the current developments regarding the agreement between Turkey and the EU, which seems to be at a crossroads4, she added: “Everything is unsure at the moment, we cannot understand why the authority is creating facts when everything is unstable and nothing working as they want”. On Monday morning it was reported from Idomeni, that authorities closed the waterlines at several points5. In addition to the severe limitation of food supplies, this gives an idea about the authorities‘ strategy for emptying the camp: Creating a lack of basic needs and forcing the people, particularly the vulnerable people, to leave by themselves – which accordingly to posts on social media is working for many people6. This was also confirmed by an inhabitant of the camp on Monday morning on the phone: “There are several buses this morning waiting for people, I think several will take this, since it is maybe the last chance”. He added that a few NGOs are present, but one NGO worker told him that they probably will not be able to come anymore from tomorrow onwards. According to CNN Greece, the upcoming eviction might take up to 7 days and is following a strategy, which we heard about as a rumor two month ago already: The forces will separate the camp into several sectors, which will be isolated from each other. Subsequently, these sectors will be emptied over several days, outside the view of media and volunteers in order to avoid witnesses7. The future of the about 9.000 inhabitants of Idomeni camp is unsure. Some sources report people are going to be brought to Thessaloniki to guarantee health service and housing8, but supporters are doubtful that there are places for everybody. Moreover, the situation in many other camps is worse than in Idomeni and disillusioning. Vorheriger Beitragdetention, deportation, dubious legislationNächster BeitragGÄNZLICH UNERWÜNSCHT. Entrechtung, Kriminalisierung und Inhaftierung von Flüchtlingen in Ungarn.